Research indicates that the tractor beam could become a reality on a small scale. Researchers from Hong Kong and China are looking into a laser called the Bessel beam to potentially make it work like the tractor beams we see in properties such as Star Trek and Spaceballs. If the Bessel beam pans out, we'll be towing junk around the universe in no time. 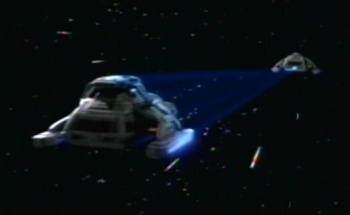 Okay, so maybe we won't be doing that until we're actually able to build a space fleet, but the Bessel beam could theoretically exhibit the properties of a tractor beam on a small scale. Right now the Bessel beam can probably only drag a single particle to its source. The technique being researched is all about imposing a "backward scattering force" through the "simultaneous excitation of multipoles in a particle." A Bessel beam can reportedly reconstruct itself on the far side of an object it hits, and the energy inside of the beam can push a particle from the opposite end toward the beam's origin. The technique adds "pulling" to previous efforts that have proven particles can be optically manipulated. This research is apparently still new, and needs to be demonstrated, but the desired result is possible. Now if we could only get that space fleet in order.